DePerrys on the Lake is a place for a relaxing vacation in a beautiful setting. 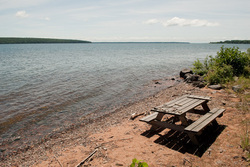 We are located just minutes north of Bayfield on the shores of Lake Superior. Contact us by e-mail or phone at (715) 779-9771 for more information or reservations. You can't get any closer to Lake Superior.